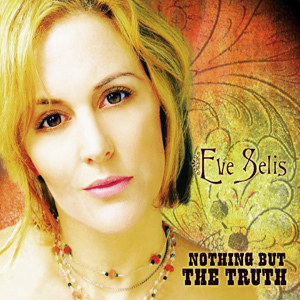 "Eve Selis isn't just a 'singer' — she's an emotion transducer who converts country, R&B, blues, folk, and rock 'n' roll signals into a megawatt zap that galvanizes everyone in its path. And as with fellow femme-furnace frontwomen Bonnie Raitt, Joan Osborne, Maria McKee, Melissa Etheridge, and Lydia Pense, the cauterizing power of Selis's voice can arc-weld material from almost any genre into a personal manifesto. I first saw Selis perform several years ago, when she was known mostly to San Diego clubbers. Soon, she was working with highly regarded Nashville songwriter/producer (and long-time Taylor player) Kim Patton-Johnston and Suzy Bogguss's husband, producer Doug Crider. In 2002, Eve released her third acclaimed CD, Do You Know Me, and as the buzz spread, savvy industry-watchers predicted that her next effort would “break” her nationally. Nothing But the Truth is that 'next' CD, and, at the risk of being a jinx, Selis's dance card should be filled to overflowing from now on. The new album has two rocket boosters that every vocalist requires to achieve escape velocity — great musicians, and a potent potpourri of songs that sound like they burst fully formed from the artist's bared soul. It opens with the country-blues-funk of the Patton-Johnson/Anne Reeves-penned “Heart Shaped Tattoo”, then snakes like a wild river through styles and moods — the fibrous hillbilly honk of “The Ballad of Kate Morgan” [with guest vocalist Jim Lauderdale], the Petty/Heartbreakers-esque “Those Words We Said”, the rockin' bar-lass sass of “Honky Tonk Town” [with guest vocalist Lynn Anderson], the rural-road balladry of “A Beautiful Day”, the 12-string-driven country-pop of “Someday”, and several other cuts worthy of mention.